Prime Minister Binyamin Netanyahu warned that Iran "would share whatever (nuclear) technology it acquired with North Korea," in an interview with one of Japan's leading newspapers on Tuesday. Speaking to Mainichi Shimbun during his visit to the country, Netanyahu remarked that in the ongoing negotiations with world powers, Iran is seeking "the capacity to make nuclear weapons. ...The outcome, if that happens, would be very bad, and it would be like North Korea." When asked about the sharing of intelligence material between Israel and Japan regarding Iran and North Korea, Netanyahu acknowledged "we have close consultations, I would say, and I think that's only natural." Netanyahu added that world powers "should insist that Iran stops developing ICBMs (intercontinental ballistic missiles), in addition to dismantling its capacity to make atomic bombs and atomic warheads." He said developing ICBMs "is obviously an indication of their plan to have nuclear weapons." "Whatever (nuclear technology) they have they will share with North Korea," warned Netanyahu. "If Iran gets to a point where it's very close to...the production of nuclear weapons, then this will immediately cause other countries in the Middle East to...go for nuclear weapons too, so the Middle East would turn into a very dangerous place." Iran's impact on regional events was further revealed in statements last week by a senior Revolutionary Guards commander, who said Syrian President Bashar Assad is "fighting this war (in Syria) as our deputy." Speaking about the peace talks, Netanyahu noted that Palestinian Authority (PA) Chairman Mahmoud Abbas has consistently refused to recognize Israel as the Jewish state, and has said that Hamas, the terror group he recently reached a unity deal with, likewise does not need to recognize Israel or renounce terrorism. "Are the Palestinians willing to accept existence of the state of Israel?" asked Netanyahu. "Up to the point where the Palestinian Authority made their pact with Hamas, which calls for our destruction, we thought that the answer would be yes. Now, national unity for peace is good. A pact with Hamas, which openly calls for our destruction, and practices terror against our people - that's bad." "I think the proper formula is a demilitarized Palestinian state that recognizes the Jewish state," added the prime minister. Remarking on the source of the conflict, Netanyahu stated "the real obstacle, that has sustained this conflict for the last 90 years, has been the persistent refusal to recognize the Jewish state in any boundary. That's why when we got out of Gaza, ...it didn't produce peace. It produced the rocket attacks on Israel, from the very areas that we left." "We haven't built new settlements in 20 years"
Netanyahu went on to address concerns that Jewish communities in Judea and Samaria might limit the chances of creating a Palestinian state in the heart of Israel. "In the last 20 years at least...no new settlement had been built. The only thing that has happened is the addition of housing in existing communities, and about 85% of the Jewish population in the territories of Judea and Samaria are concentrated in urban suburbs of Tel Aviv and Jerusalem, in a very small area," said Netanyahu. The prime minister argued that the conflict far predates the "settlements" since Israel liberated Judea and Samaria in 1967 from the Jordanian occupation. "For 50 years - from 1920 until 1967, that's 47 years. What was that (conflict) about? It's rooted in the persistent refusal to recognize a Jewish state in any boundary," Netanyahu said. Netanyahu remarked that he's told the PA many times to "make real peace, and you'll win the people of Israel." 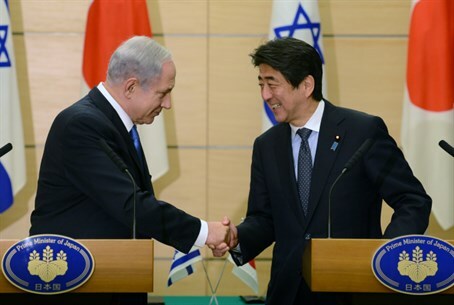 Israel and Japan have a great opportunity to cooperate for mutual prosperity according to the prime minister. "Japan is a center of science and technology in the world, Israel is one of the other centers. ...If you have a cell phone (you have) a piece of Israel in (your) cell phone," said Netanyahu. "One particular area, that is absolutely critical for Japan...is how to protect your bank accounts, how to protect your traffic grid, your electricity power plants from cyber-attacks. Israel is a world center of cybersecurity, and we're seeking to cooperate...with other countries and certainly with Japan," added the prime minister. Joining Netanyahu in his official visit to Japan, Eugene Kandel, Chairman of the National Economic Council, similarly praised the opportunities of cooperation in a Tokyo press conference on Wednesday. "The presence and cooperation of Japanese corporations are lacking in Israel. In various industrial fields, there are numerous Israeli corporations that can become partners of Japan," Kandel said, according to the Japanese-language Asahi Shimbun. Kandel remarked that due to the security challenges facing Israel, corporations in the Jewish state are at "an extremely high level" in the fields of IT (internet technology) and hi-tech, adding "there are many ways in which we can cooperate with Japan."